It's scientifically proven that Music Makes Your Child Smarter!
" ... Music also can contribute to the development of confidence, social skills, teamwork, self-discipline and much more. To make music well, the player or singer is using intricate intellectual, emotional and movement skills, often in a very exact way with other performers, for self-expression and communication. There are physical changes in the brain accompanying repeated activity of any sort, so it is no surprise that the brain changes in response to regular musical practice. But what appears to be unusual is that music-making invokes simultaneous activity in many brain centres, some of which are seats of other, non-musical skills. So those centres also will grow in response to musical activity, and there is greater integration of mental activity across the brain. That may account in part for music's positive effect on the development of such a broad array of abilities. The other thing about music is that kids love it. There are many instances where the addition of a good music program to an underperforming school has lifted test results, simply because on music days the kids turn up. If they are in school, they could be standing in the path of a fact, albeit accidentally. " The ultimate goal of most music educators is to engage people in a music-rich and music-fulfilled life, rather than to make people 'smarter'. For that reason it would be a pity if the main title (and sub-title, "How Music Helps Every Child s Development") made them a little squeamish, for this is an excellent and practical work. Fortunately, in the inimitable words of songsmith Elvis Costello, writer Phillip Sheppard's 'aim is true' and the book, actually aimed more at parents, is rich in both information and music learning ideas. Sheppard's own goal in this book is to combine his knowledge of the neuroscience of music, which takes up approximately half its contents, with suggestions on how our knowledge of what music does for the body and the mind can be applied to learning in music. To attempt justice to both areas in the space of one book is a lofty ideal, but Sheppard puts his case well, and the most positive aspect of the book is that, whereas most authors who seek to promote the benefits of music as a smartness enhancer tend to focus on only the cognitive by-products such as heightened literacy and numeracy skills, Sheppard is all-encompassing. He emphasises the holistic nature of music and its contribution to all aspects of our 'being'. The book is well-shaped, and although the section devoted to the neuroscientific aspects of music could easily have been dry and inaccessible, Sheppard has gone out of his way to ensure that this is not the case. There are sacrifices as a result. Many researchers who have devoted their lives to studying the neuroscience of music don't rate a mention here, for example Peretz, Zattore, Parsons, Thaut, Hodges and Sloboda. However, this may be because Sheppard has chosen to focus on providing broad brushstrokes of what he sees as pivotal to his argument. His direction is important to future considerations in the overall design and delivery of music experiences for children, not just by parents, but by all those involved in music education. I remember hearing a speaker at a conference a couple of years ago say that, if teachers wanted students to be better at numeracy and literacy, they should do more numeracy and literacy, not more music. At the time, this seemed to make sense, but there are qualities in the experience of music-making that 'set-up' the brain and the body to be able to learn more effectively in other areas. And although this should not be the ultimate goal of music education, it is an important aspect of what music 'does' for people. So Sheppard's first edict is that 'music can dramatically improve physiological and mental coordination, which makes it an extremely effective catalyst for learning and development'. He describes the essential nature of a sense of beat and rhythm and its impact on our overall bodily coordination and ability to decipher the spacing in language. Indeed there is a strong correlation between an inability to feel beat and rhythm, and dyslexia. Equally, there is an emerging understanding of the relationship between the ability to discriminate between sounds of different pitch, and spatial orientation--spatial awareness not only relating to mathematical ability, but the basic ability to relate to others and develop a sense of personal identity. Sheppard covers some of this territory, plus the influence of music learning on memory, social skills, emotional wellbeing and the importance of creativity. He emphasises the unique role of the right hemisphere of the brain in musical processing. He highlights the necessity of engaging in music-making across the range of musical activities, with emphasis on movement to music, playing instruments, singing and creating music; all essential processes if the brain's and body's potential benefits are to be reaped from musical experience. Much of Sheppard's work is with very young children and so the bulk of the learning activities are a towards them. He provides guidance for parents of children pre-birth to nine years of age, plus guidance on a choice of instruments for children of varying ages. For example, being cellist may have weighted his 'starter instruments' recommendation towards strings, rather than keyboards! Activities for younger children include songs, many with ac' and rhythms; suggested movement activities with some sensational listings of music based on themes—for exampl bedtime story music, animals and train music. There are m. suggested activities for musical creativity, developing frorr exploration of sound to the application of the musical elen structure sounds with increasing complexity. There is an accompanying CD, which contains music for movement a relaxation, plus some of the songs suggested in the text. Ultimately, the most rewarding feature of this book is its through reason and then demonstration, of a rationale fc comprehensive, holistic experiences in the musical jourr people from pre-birth onwards. It is a very practical and friendly document, which makes essential reading for p young children, and additionally, early childhood and p educators. 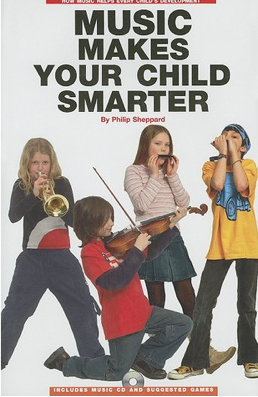 When musician, parent, and music educator Philip Sheppard undertook the writing of Music Makes Your Child Smarter his working title was Can Music Make Your Child Smarter? Though already intensively involved in music in all areas of his life, Sheppard wanted to explore the question from a position of skepticism. As he researched and wrote, however, he came to the undeniable the book's current title. Presented in two parts, Sheppard lays out the evidence for the effect of music upon the developing minds of children, with a particular focus on those ages seven and under. Sheppard isn't talking about a Mozart Effect approach, which Sheppard points out is founded upon questionable research data. The evidence he shares about the effects of music upon the growing mind are most evident when music is actively explored, played with, and experienced first hand - not through passively listening to classical music in the background. The first half of the book, wherein Sheppard lays out his arguments, combines research findings with his own personal anecdotes as teacher, musician, and parent. I found the writing in this section to be somewhat choppy, at times repetitive, and, due to the lack of footnotes, sounding more like personal conviction than a quantitatively measured argument. The book does include a research list and bibliography in the appendix, but without end notes it is difficult to line up research papers with the points that Sheppard has made in the text. Still, no parent reading his arguments will be able to walk away without a niggling feeling that they must do something to encourage the development of their child's natural capacity for music before the crucial age of seven. The second half of Music Makes Your Child Smarter explores activities from pre-birth to early elementary (up to age nine), with a brief introduction to the options available for formal music lessons as children grow. Eschewing the popularly held belief that passively listening to the classics will somehow make your baby smarter, Sheppard's goal is to instead encourage parents to step up and fill the role as first music teacher by engaging children in active music making, musical play, integration with art, and a wide array of other simple activities. Broken into age groups, Sheppard starts with simple lullabies sung by parents to unborn children, moves into musical games, finger plays, and motion songs, then into homemade instruments, spontaneous composition games, body percussion, and children increase in age. A parent armed with the suggested activities found within the pages of the book and the samples on the included CD (with cello performances by Sheppard himself) will be able to jump in with only this resource at their disposal and start enjoying music with their children. An oddity that I noticed was that some of the longer songs in the book — some with several pages of lyrics — were not included on the CD, though the tunes were unfamiliar to me. In many cases the tunes are provided, and, for some that are very well known, the lyrics serve as a reminder to parents who may have forgotten classics from their own childhoods — no tunes necessary. For parents whose children are ready to move into formal instruction, Sheppard provides a breakdown of the most popular instruments, along with ratings for "startability," expense, and his own commentary about versatility, transition to other instruments, and any special considerations to take into account. Sheppard also moves far beyond the classical range with suggestions for additional listening from genres ranging from jazz, rock, disco, and the classics, too, of course. The combination of Sheppard's text with the accompanying 53 track CD provides a comprehensive introductory-level overview to early-childhood music education for parents. Any parent who puts the exercises held within to use with their children is sure to be met with an enthusiastic response from their little ones and lay the foundation for a life-long appreciation of music.